Drawn by devotion to the Sacred Heart of Jesus, which flourished in the church of her time, Clelia Merloni made Jesus the King and center of her heart. 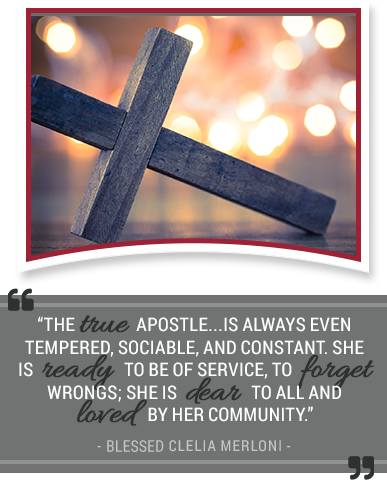 Like the first apostles, she wanted to express in her own life, and in her apostolate, the deep faith in and love for Jesus that inflamed her and drew her to love Him even to the cross. Mother Clelia's spirituality was rooted in contemplation of the Paschal Mystery, symbolized by the pierced heart, mystery of life and death, sign of love, and salvation. It took form in an ardent search for God and for souls and a constant desire to transcend self in order to conform to Christ even to the total sacrifice of self. Her spirituality manifested itself in an unquenchable fire of love and zeal to make others know and love the Heart of Jesus. God alone was the motivating force of Mother Clelia's life. She felt drawn to make reparation for the ingratitude Jesus received from so many people. Her loving fidelity, especially through Eucharistic adoration, was the passionate expression of this reparation. Because of her own intimate union with God, she wanted to awaken in all people a deep desire for Him, helping them understand His goodness, mercy, and compassion. To a world torn by hatred and indifference toward God and His Church, a world in which people sought false images of salvation and happiness, Mother Clelia presented the Heart of Christ "which has so loved us..." as the fulfillment of all expectations, the fountain of life, and the source of happiness and salvation. Mother Clelia entrusted this legacy to her spiritual daughters, the Apostles of the Sacred Heart of Jesus. Today, as a hundred years ago, the Apostles seek to be increasingly what God intends us to be in the church: witnesses of faith, signs of hope, and evangelizers through service. The Apostles of the Sacred Heart of Jesus strive to imitate the first apostles by living out the call to build up the Body of Christ. We consecrate our lives to the love of the Heart of Jesus and work to diffuse that love out into the world. Through our ministries, we strive to "promote a spirituality of communion," whereby the joys or sufferings of another become our own (Novo Millennio Ineunte, 43). Our devotion to the Heart of Christ prompts us to give a human face to the love of God. In this way, we hope that divine goodness, mercy, and compassion may bring healing and comfort to the entire human family.